Oh Fabio, if only you’d never uttered the word butter. That ruined you for me. Do they still make shirts without buttons? How inconvenient on a cold day. I thought of all these things and more when I saw this cover. I laughed and laughed. You’ve got to be kidding! And laughed some more. But I wasn’t supposed to laugh. This is a serious historical romance, not a comedy. 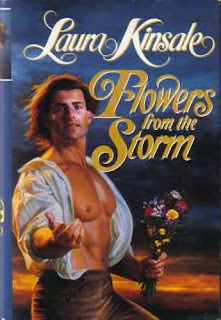 Luckily, it didn’t take much to remove this hot-buttered Fabio from my thoughts as I imagined the tortured hero from this novel, and while only tentatively dipping my toe in at first I quickly jumped in whole-heartedly. This book consumed me. What happens next is so stinking good I just don’t have the heart to spill the beans, sorry, but kudos to Kinsale for giving us a hero who can’t talk. She takes him to his barest self, almost stripped of everything; a naked spirit - See! I’m obsessed with skin after reading this book. I got a great sense of his frustration, his all out fury with his illness, and then Maddy as she wrestles with her growing feelings for him and her strict religion. It was well written. It was engaging. At times, it held me by the throat. yowzah! this is my wife's kind of book. i'll have to see if she's read anything by Ms. Kinsale. stay tuned. I haven't read romance novels in a really long time, but your review makes this one sound compelling. I just might have to check this one out. Great review! And man, those pecs! Ooh, I'm not a Fabio type of woman. Is it OK if Fabio doesn't melt me like butter? Nor does George Clooney or Bradd Pitt, but Matt Damon... Where was I? Right, Fabio. I'm just not impressed with the flowing long hair and the bulging pecs. I also get plenty of accent from my husband. Hamilcar - She'll love it, no question. If she reads this book you'll be personally thanking me. I'm thinking of investing in my own copy to keep for times of...trial, or..what not. And oh yeah chemist man, there's math in it too. Trixie - Come back to within the romancy fold! This book is an excellent distraction and the perfect place to start. But beware it's a little descriptive in parts, but only a few, the book is really story driven believe it or not, setting it apart from your run-of-the-mill romance. Amanda and Christina - Totally understand. Think how many more people would read this book if he wasn't on the cover! Now Matt Damon, I can totally picture him in the part...excuse me a moment. Liz went to the used-book store yesterday and found one LK book : "For My Lady's Heart". she's also been looking for new authors of romance novels to read. apparently she's pretty much read everything by her current batch of favorite writers. Matt Damon on the cover, mmmm... I'd probably pick it up then. Once in a great while, I'll pick up a romance novel. Sometimes the cover doesn't influence me, unless I don't like the people on the cover then I might not pick it up at all. Funny how the cover can make or break a book.